Enhance the tactical effectiveness of shotguns fitted with the SpecOps stock. Includes raised cheekpieces for better cheekweld and improved stability. Use low cheekpiece on guns with standard bead, rifle or ghost ring sights, high cheekpiece for use with optical, holographic, or raised ghost ring sights. Shell holder and spare battery storage compartment mount to either side of the cheekpiece through pre-drilled holes with eight included screws. 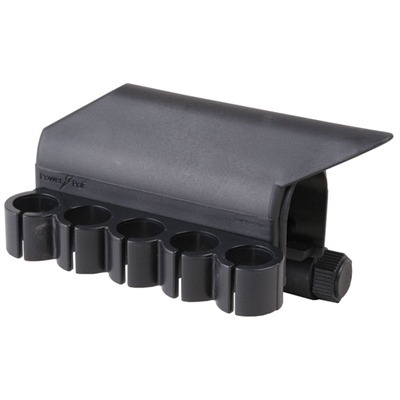 Shell holder keeps five extra rounds. PowerPak assembly snaps firmly in place on SpecOps stock. Mfg: Blackhawk Industries SPECS: Injection-molded, high-impact polymer resin, matte black. Kit contains high and low cheek pieces, shotshell holder, battery storage compartment, (12) assembly screws, and Allen wrench. Includes instructions.